The National PTA Reflections Program is an arts recognition and achievement program for Pre-K- 12th grade students. It offers these students opportunities to express themselves creatively in six different art categories and to receive positive recognition for original works of art inspired by a pre-selected theme. Students can participate in Dance, Film, Literature, Music, Photography, and Visual Arts-both 2D and 3D. Any questions? 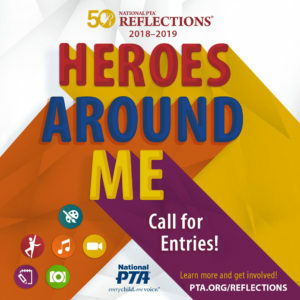 Please send email to reflections@afhsptsa.org.